Yesterday was Superbowl day! My mate Richo recorded the game and a group of guys went round to his place after work for some beers and some FOOTBALL! There was no other beer that we could possibly drink, only the 'King of Beers' would suffice. This is a new sub-section of the blog for mass produced lagers that don't fit into any other section. It's also quite interesting to compare the micro breweries of certain countries with their macro counterparts. Being real men we drank full-strength Budweiser as opposed to Bud Light, which disgustingly is the most consumed beer worldwide! The pour is surprisingly good for a beer with such a bad reputation worldwide. Budweiser pours a clear straw colour, with streams of bubbles rising to a reasonable size off-white head. The head looks impressive at first but falls very quickly to a poor half ring of foam. There is almost no lacing to speak of, it does give a slightly cheap feel. It's not a great looking beer. The nose of this beer is not impressive at all, it's very very bland. This is not necessarily a bad thing however as many adjunct lagers can have a very offensive smell. It smells like slightly sweet grains, with tiny hints of floral hops also present. It doesn't smell good, but it doesn't smell bad either; not bad for a macro. 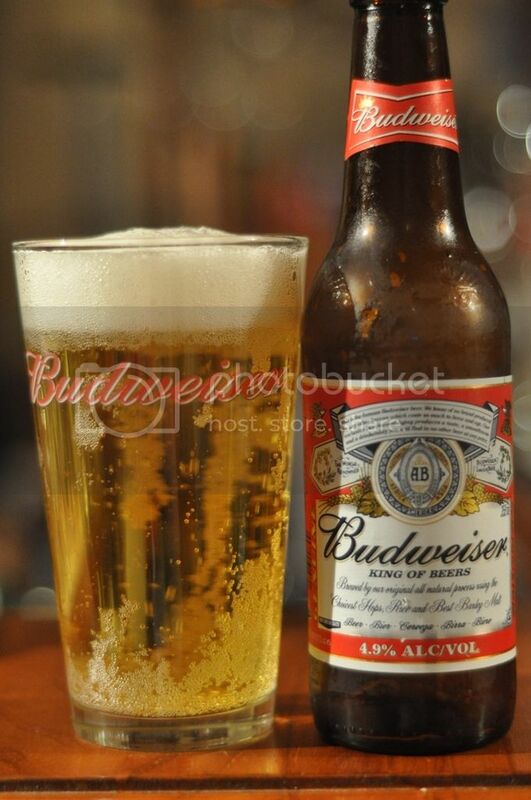 Budweiser's claim that it is the King of Beers is a big call, and while the Anheuser-Busch corporation may produce the most beer it certainly doesn't taste the best! The flavour isn't appealing and is mostly grainy with some bitterness but a lack of any real hop flavouring. The carbonation is really high and even a mildly crisp finish, can't save this relatively weak beer. Now the above is a technical review of this beer, and technically it fails. However in the context of watching some FOOTBALL and eating some wings coated in Louisiana hot sauce, it was a sensational beer. It's a surprisingly good drinking beer and (judging by how my head felt this morning) makes an excellent session beer. I'd be happy to get on it again, if you haven't had it before it's not a bad bet if you need a cheapish 6-pack.